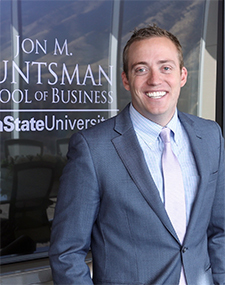 Blake comes to the Huntsman School most recently from the University of California Santa Barbara where he was leading various strategic enrollment initiatives in the Office of the Executive Vice Chancellor. He received his PhD from Purdue University in 2018. Blake's research focuses on higher education administration, learning design, and college/career readiness. He published his first book, The Middle School Student's Guide to Academic Success, with Simon & Schuster and FranklinCovey in 2016. Blake has a program director and instructor appointment in the School of Teacher Education and Leadership at Utah State's Emma Eccles Jones College of Education and Human Services. He directs the Master's of Education in Instruction Leadership - Higher Education/Student Affairs program. Blake has worked in enrollment management administration roles at both Purdue University and Dixie State University. He has a MEd in higher education administration from Vanderbilt University and three BA degrees in business administration, marketing, and international business from the Huntsman School of Business. Blake was a Huntsman Scholar, University Ambassador, and student-athlete (tennis) during his time at Utah State. Blake met his wife, Staci, during their time in student leadership roles at USU. Staci completed her degree in speech communication and is a registered nurse. Blake and Staci have four children.